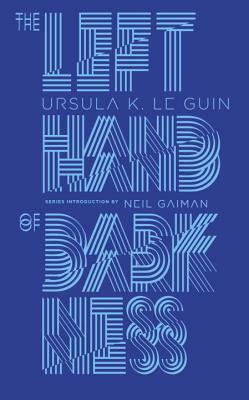 A groundbreaking work of science fiction, The Left Hand of Darkness tells the story of a lone human emissary’s mission to Winter, an unknown alien world whose inhabitants can choose—and change—their gender. His goal is to facilitate Winter’s inclusion in a growing intergalactic civilization. But to do so he must bridge the gulf between his own views and those of the completely dissimilar culture that he encounters. Exploring questions of psychology, society, and human emotion in an alien world, The Left Hand of Darkness stands as a landmark achievement in the annals of science fiction. Ursula K. Le Guin is the first author to win both the Hugo and Nebula awards twice. Her novels include Rocannon’s World, Planet of Exile, City of Illusions, and The Dispossessed. Born in Berkeley, California, in 1929, Le Guin lives in Portland, Oregon. Neil Gaiman (series introduction) is the #1 New York Times bestselling author of more than twenty books for readers of all ages, including American Gods, The Ocean at the End of the Lane, The Graveyard Book, Coraline, and the Sandman series of graphic novels. He is Professor in the Arts at Bard College. Alex Trochut (cover designer) is an award-winning artist, graphic designer, illustrator, and typographer. He has designed for The New York Times, The Guardian, Nike, Adidas, The Rolling Stones, Coca-Cola, and Pepsi and was nominated for a 2016 Grammy Award for Best Recording Package. Born in Barcelona, Spain, he lives in Brooklyn.